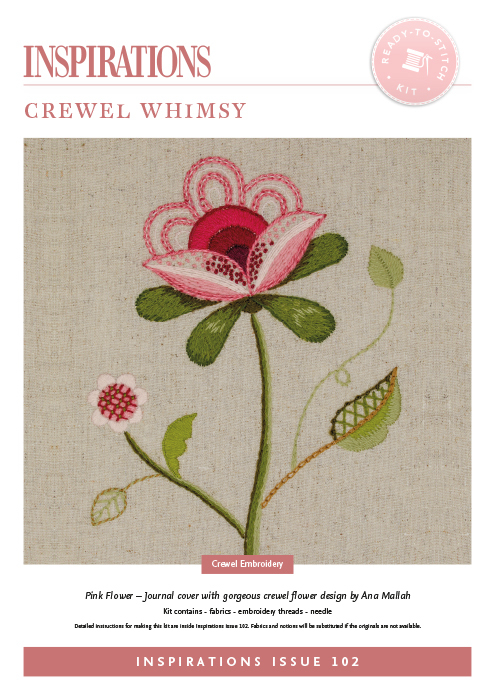 Journal cover with gorgeous crewel flower design. Embroidered book covers have a long and rich history and many beautiful examples remain in museums and collections around the world. An ideal way to personalise a precious notebook or diary, this elegant single flower design is worked with wool and mohair threads onto a natural linen/cotton fabric. All our kits include premium quality materials with everything sourced, inspected and cut to measure to enable your project to be as beautiful as the original featured in the magazine or book. The instructions for this product are available within 'Inspirations Issue 102' and are not included with this product. During checkout, use the promotional code printed on the fly sheet included with each subscriber copy of the magazine, to receive your discount on all kits.